The US government spends over $500 billion annually on outsourcing contracts for procuring a wide range of goods and services - a large part being spent on services such as Information Technology, Professional Services, Facilities and Construction, and Transportation & Logistics Services. With billions of dollars of tax payers’ money at stake across these services contracts, a robust oversight and governance infrastructure is critical to ensure that the promised value is delivered by suppliers in such engagements. 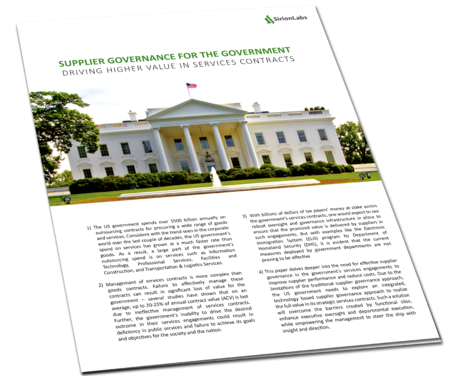 Download this paper to learn how an integrated, technology-based supplier governance approach can help government organizations improve supplier performance and reduce value leakage in their services engagements.